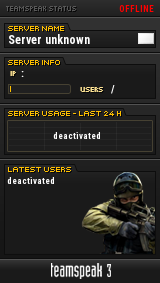 I am having trouble connecting to this server, it sends me straight back out again. Is this a localized problem or is anyone else having it? The GO servers probably need an update. I hadn't done it for a while as they weren't being used but I'll be on later so can apply all the updates then. Leon wrote: The GO servers probably need an update. I hadn't done it for a while as they weren't being used but I'll be on later so can apply all the updates then. It still says 'server is not responding'. I will keep my eyes peeled for events happening on CS:GO.